Jeep Safari represents one of the racier and less explored aspects of adventure tourism in India. It's definitely a tourism with a difference. This recently emerged concept basically originated in western countries. The fusion of motor and nature is something that is still alien to the psyche of Indians. The outdoor element is mixed with the thrill of the rides undertaken. Jeep Safari in India is still a fledgling concept because only those with fat purses can pursue it. It includes predominantly riding through the rugged and cavernous kuccha tracks and lonesome and wind swept planes nestled in the foothills of Himalayas. Just imagine the experience of driving on jeeps and HUV's trudges through uninhabited stretches with the hill on one side and a deep gorge on the other. Nestled in the foothills of Himalayas, Ladakh and Leh are one of the premier hunting grounds for all the riders participating in jeep safaris in India. Some other treks in the upper reaches of Himalayas are Monastery special, Sareolsar lake, Apple belt safari, temple safari and other lake special safaris. 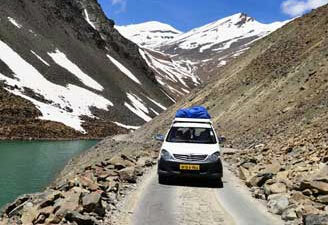 These routes are very popular as the corporate sponsored safaris in India. Adventure lovers should be mentally and physically fit because Jeep Safari may even lead up to a height of over 10,000 feet above the sea level. So, adventure seekers must go for medical check up before planning the trip. You should also ensure to keep along some things with you including suntan lotion, moisturisers, sunglasses and suitable dresses. June to September is the best time for Ladakh and the Himalayan regions. October to March is the ideal time for a Jeep Safari in Rajasthan. 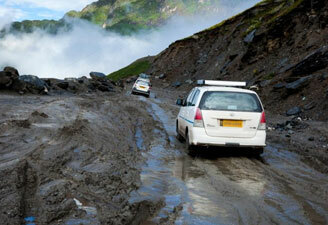 Tourists are advised to avoid monsoons and summers. If you want to explore the wilds or miles of sand dunes in the desert, jeep safari is the best choice for you. The Jeep Safari - Lehreason is that it's a powerful vehicle which, besides ensuring your safety, also provides you the best comfort and takes you through the route in the shortest possible time. So, whenever a tiger or lion growls in the forests or an insect makes a frightening noise in the desert, you should remain confined to your jeep and enjoy the scary ambiance ! Time duration of Jeep Safaris depends largely on the destinations that are to be covered. If you are going for wildlife safari on a jeep, you may last for a day or two only. 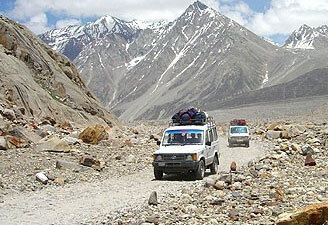 But all the safaris passing through the rugged terrains in Himalayan region or deserts of Rajasthan take up to weeks. In other words, jeep safaris take shorter time period in than some other safaris like camel safaris. If you give top priority to safety while on any adventure trip, Jeep safari fairs well on this account. It offers the best safety in all situations and destinations. They also offer spectacular views and more comfort to the tourists. They also are time saving and allow more flexibility in arranging the itinerary as you may incorporate the changes on a short notice. But at the same time, you also have some disadvantages in a Jeep Safari. It doesn't allow tourists to experience a region from close quarters. Chances to contact the local populace are also limited here. The element of adventure, in fact, is lesser in these safaris.